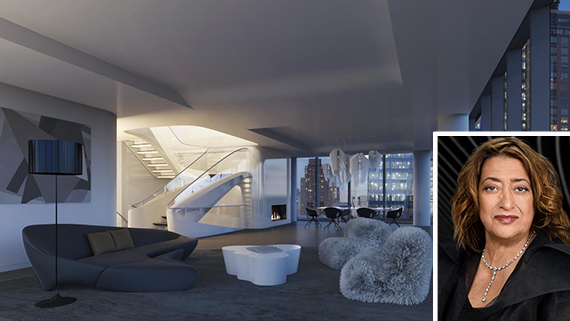 As the only New York City penthouse Zaha Hadid will ever design, 520 West 28th Street‘s triplex may seem priceless. But it is now available — for $50 million. The Related Companies announced Monday that the triplex penthouse at 520 West 28th Street is officially for sale. The Corcoran Group listing arrived today, roughly two months after Hadid’s sudden death. The 65-year-old architect suffered a heart attack at a Miami hospital on March 31. The Pritzker Prize winner was best known for her curvaceous, sculpture-like designs, a trope that is incorporated in Related’s spaceship-like High Line project. The penthouse, referred to as Penthouse 37, spans 6,853 square feet, has five bedrooms and six-and-a-half bathrooms. A “signature Zaha Hadid” sculptural staircase connects all three floors. The roof of the penthouse also has a glass-enclosed pavilion and a 2,218 square foot wraparound terrace and outdoor kitchen. The penthouse is one of 39 units designed by Hadid in the condominium project. 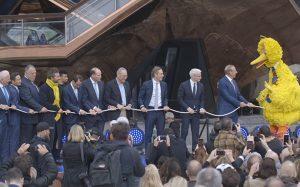 Hadid’s firm worked alongside Ismael Levya Architects on the building. Related has said that Hadid’s design work has long been completed on the building, which is slated to open in early 2017.